We have previously talked about how to Recover the Windows Login password within minutes which allows you to recover your Windows password online. Another method to login to a password protected Windows even if you do not have the password is by making Windows accept any password, and this is a far better way to get into Windows XP. It is easy and it does not reset the password which will definitely alert the administrator of the computer. Kon-Boot is another fantastic tool for doing this and there are free and paid versions available that will allow access to Windows XP, Vista, 7, 8 and even Linux without knowing the password. Kon-Boot is also present on the great Hiren’s Boot CD rescue disc. There are also other useful methods getting into a password protected Windows such as cracking the password so you can find out what the real password is. Hacking into a computer running Windows XP without changing or resetting the password will allow you to find out all and any passwords on the machine (including admin accounts). You do not need access to any accounts to do this, but of course, do not perform this method on anyone else’s computer without proper authorization. The hacking method described below works only on Windows XP. 3. Unzip the downloaded dpl.zip with the password raymond and you’ll get a dpl.ISO image. 4. Burn the ISO using a burning program that is capable of burning ISO images. 5. After you have the disc, boot it from the CD or DVD drive. You will see Windows 2000 Setup and it will load some files. 6. Press “R” to install DreamPackPL. If you get a “Setup did not find any hard disk drives installed in your computer” error, refer to this post on the subject. 8. Select the Windows installation that is currently on the computer (Normally is “1” if you only have one Windows installed). 11. 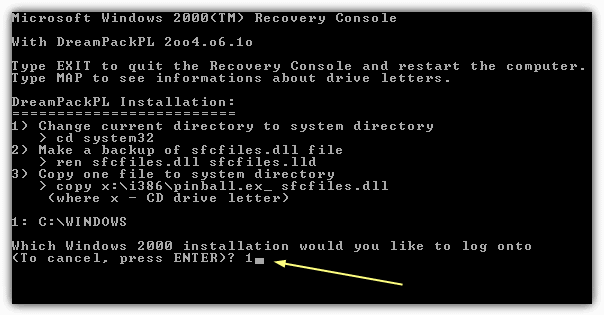 Type “exit“, take out disk and reboot to Windows normally. 12. 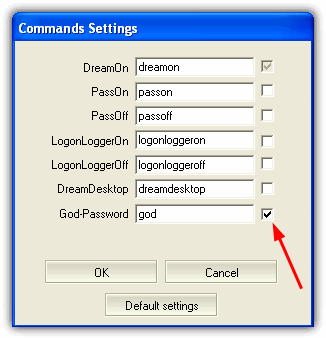 In the user password field, type “dreamon” (without quotes) and the DreamPack menu will appear. 13. Click the top gray graphic in the DreamPack window and you will get a menu popup. Go to Commands -> Commands Settings. 14. In the Commands Settings window, enable the God-Password by putting a tick in its box. Click OK.
15. Now type “god” into the user password field to get in Windows. You can also go to the DreamPackPL Passwords menu and select “Logon with wrong password and hash”. This option allows you to login with ANY password instead of using god everytime. Note: We were unable to bring up the DreamPackPL for the first time because Kaspersky Anti-Virus was already running in background. Most antivirus software today has already labeled this tool as a Hack-Tool. A Hack-Tool is NOT a virus. DreamPackPL merely helps you bypass the Windows Login screen and it is not destructive. For your information, files that are not detected aren’t necessarily 100% safe because there are private crypter tools being sold in underground forums that can make a detected file fully undetected by any antivirus. Power Tip: If you are on Windows 7, we discovered that there is a working backdoor method where you can run an elevated command prompt with system privileges. This will allow you to reset any user account password or even creating a new administrator account without even logging in. whats the advantage to using this vs something like Ophcrack? Obviously it depends on the length/complexity of the password. If the password is long and complex, Ophcrack could take hours to find it. Dreampack gets you in within a few minutes. Kon-Boot is even quicker/better still. would this work by booting from a usb drive? It should do, try using something like Rufus to write the ISO to USB flash drive. oh my god, it works wow. hi i was trying to hack on my teacher’s computer and it WORKED!!!!!!!!! Super.. Thanks it help me out in just a few seconds. Thank you man! You realy helped me with this tutorial! Thank you so much! Worked perfectly! I needed to get into a 6 year old laptop that had not been turned on in 4 years and nobody remembered the password! This helps me a lot and thanks for this software. Thanks Really i Appreciate it. You always do an excellent post which is always true and correct and very much useful for others at no cost. Hi!,i’m student from computer science from National university of Rwanda. we like this tips that you’re providing for your web visitors and computer enhancement technology!good!!!!!!! Great post. Another way to hack xp. Always good to have another trick up my sleeve! thanks so much!! this worked after 3 days of trying all the other tips i found. Ray – You are awesome! Where the RIPLinuX and the always reliable Ophcrack failed, your method worked! I was working on a XP home PC that needed a password cracked, normally easy but my other Linux hacks wouldn’t recognize my SATA drive. I wasn’t able to get anywhere initially with DreamPack using command/God because all the accounts were set to “Limited”. But then I noticed the “Windows Accounts Panel” option… and voila! Problem solved! Thank you! THIS IS A GOOD PROGRAM OR SOFTWARE. I tried the hack and it works great! The XP password hack is a life saver! I had my doubt as I read the steps posted in the article. You’re my hero! 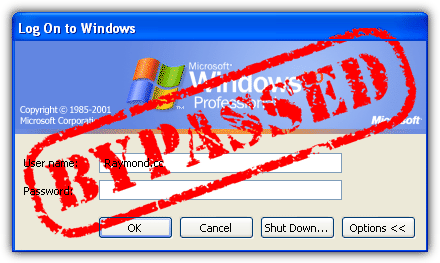 Raymond ‘like your website ‘it is very helpful and now i have a new way to bypass an XP password window. yea man, your site is really worth reading, such good infos u have collected here. you are really great and your windows hack solution is really very great!! Thanks for your valuable information , I will try this out …. hey raymond great work. i really appreciate what u have have taught but i want to know more about this hacking stuff & also lots of freewares that help me do so. “thanks,for the help”! “send me more info on hacking”! this is wonderful. i really thank you for giving this great tip or this software. This is wonderful. I have succeeded. it is a good tutorial. Thank you very much. two words : THANK YOU !!!!!!!! It’s nice article. I need it in resetting my pc password. Thanks! Perfect!! followed the step-by-step (couldn’t have been easier to follow!) worked like none other!! thank you so much!!! wow great!! thanks for your genius idea. keep it up. Your the Man! hello raymond, this is really good. thanks. This really helped me alot, my daughter had written a password which she did not remember and did not know what to do till I found this information. It really helped me alot. Thank God didn’t have to erase the pc and start a full install again. Keep up the good work. Hey, nice post i like it dude. A very useful post indeed, I wonder how you get these information. Raymond… You are giving us such a nice and useful post. thanks.